The concept of the Scottie Rally began in the winter of 2000 shortly after our first Scottish Terrier, Shayna McPunim Bronsky, was diagnosed with bladder cancer at the age of almost twelve. While ambivalent, Michele Bronsky started making phone calls to start finding a connection for potential breeders. Because of Shayna’s diagnosis and uncertainty regarding the course of her illness, we decided to gather people together in Door County to celebrate the lives of Scotties. It was the best decision we ever made! The friendships we developed through that first event sustained us during the last few months of Shayna’s life and have been lifesaving to us after her passing. Just like each of our Scotties…the people who care for them are just as special! into the end of that paragraph. Our first gathering of Scottie lovers began in May, 2001 with 9 Scotties and 24 humans as a celebration of this noble breed. What ensued over the following years was a progressive expansion of people from all over North America who love Scottish Terriers because of their “scotti-tude”, loyalty, companionship and unconditional love they provide. As a result the Rally has provided substantial annual donations to support the work of Scottish Terrier Rescue and health related research and education on a national level. After our 4th year of holding the Rally we decided it was time to form a 501(c)(3) non-profit organization in 2005. The decision to do this moved the Scottie Rally from an event to an organization with volunteer Board members. We are proud to be one of the largest Scottie gatherings in the United States and continue to be one of the largest contributors to the STCA Health Trust Fund (HTF) for Scottie related research and regional symposiums. 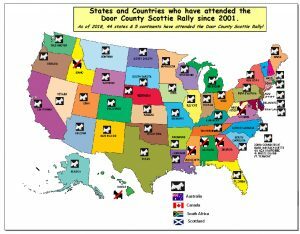 The Door County Scottie Rally (DCSR), Inc is a charitable non-profit 501(c)(3) organization. All donations made to DCSR whether in the form of cash or an auction item are tax deductible. Donors are encouraged to consult with their tax advisor for more information. Thank you for your support of the work we do….it is a labor of love for all involved…whether you’re a volunteer, donor and/or an attendee! You have the deepest arooooos (thanks) on behalf of all Scotties!